with several big projects underway and almost complete. 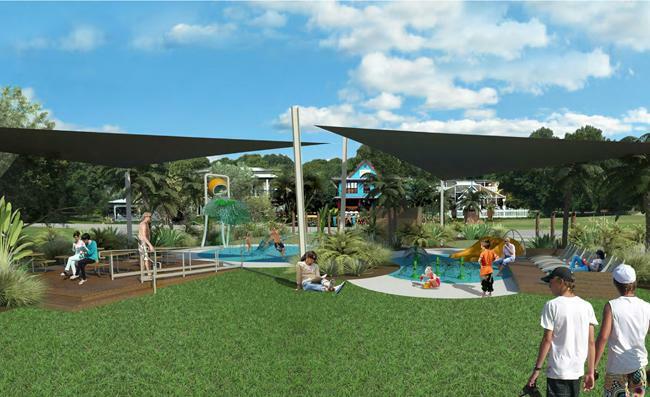 The Club has been working hard with Cassowary Coast Council on plans for the Rotary Park Splash Pad at Rotary Park Mission Beach. It’s hoped plans will be finalised in the early new year and the Club is seeking sponsorship, funding, donations and in-kind support to complete this community-focussed project – one which will be a huge boost to locals and visitors alike once complete. Club spokesperson Tom Brown said that there’s opportunity for the local community to donate and that the advertising Banner will be seen around Mission Beach over the coming months. “The popular Rotary Money Spinner will also be at various shops who are supporting the cause,” Mr Brown said. Another project Rotary has worked extensively on over the past months is the updated and to-scale Mission Beach area Walking Track Map. “This map will be available to locals and visitors with the bonus of now being to-scale so that people using the map can now calculate how far their walk is going to be,” Mr Brown said. Mission Beach State School Year 7's celebrated their graduation at the Mission Beach Resort. 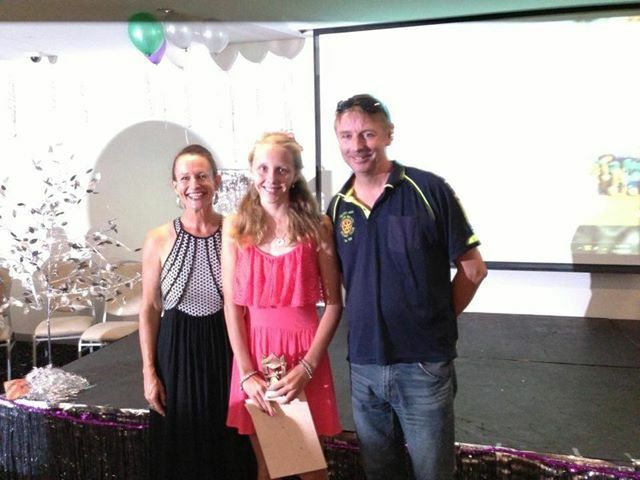 Congratulations to Georgia Hayley for being awarded Dux of year 7. Rotary member Ru Carslake was pleased to present Georgia with her prize of $100 cash. Mr Carslake said that the presentation for Dux wraps the Rotary year up in a way that’s really up-lifting. “Seeing the future of Mission Beach assembled in one room, celebrating the end of primary school and preparing for high school is a big thrill for Rotary members each year,” he said. The reinstatement of Cutten Bros Walking Track has been another ongoing project post Yasi and almost complete. Club President Chris May said that the track has cultural and historical significance to the Mission Beach area and much work has been done to ensure the track remains. “It’s been recognised that the Cutten Bros track is a must-do for visitors to Mission Beach so ensuring it’s open and accessible also contributes to the tourism sector,” Mr May said. As well as these major projects Rotary Club of Mission Beach has been responsible for the stinger vinegar stations around the local area and of course volunteers are great at cooking on the barbeque. 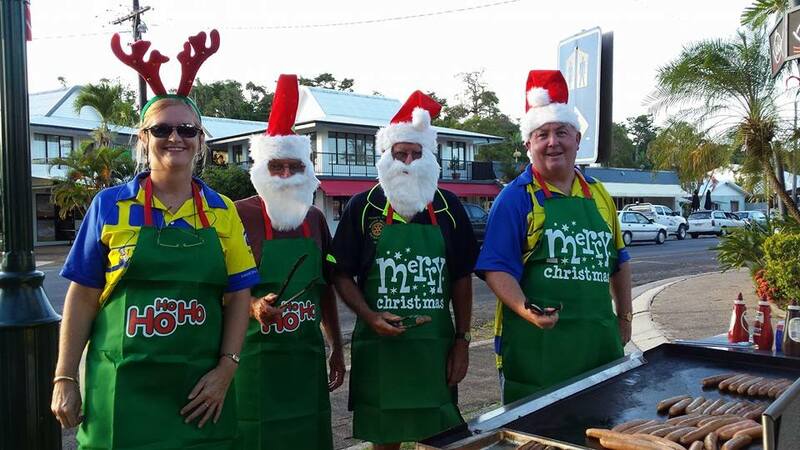 The most recent barbequing event was at Christmas comes to Village Green (Thursday 12) where club volunteers cooked sausages for those enjoying Christmas festivities. Club Treasurer Andrew Baker (the one without the beard in the pic!) said that both Rotary and Lions are well known for feeding the masses at local events. “I’m not sure how many sausages I’ve cooked since being a Rotarian but I’m always sure that people appreciate our work in the community,” Mr Baker said. The Monster Markets at Wongaling Beach are Mission Beach Rotary’s biggest source of revenue annually and this year the Club took over the running of the local Mission Beach markets as well. The Monster Markets are well supported by tourists and locals with frequent requests for them to be operating all year around, instead of April to November, however the weather’s the biggest factor in why markets aren’t held every month of the year. The Club, which only has thirteen active members, welcomed some new members this year and Club Secretary Trish Moore said that people are welcome to come along to a meeting to see what happens. “Rotary isn’t only about community service it’s provides opportunities for networking, professional development and personal growth,” Ms Moore said. In wrapping up for 2013, President Chris May said he would like to thank everyone who supported Rotary Club of Mission Beach’s efforts during the year and wished everyone a happy, safe and healthy festive season.